One of the Persian carpets that makes me happiest is my Qasq’ai , or Qashqai. 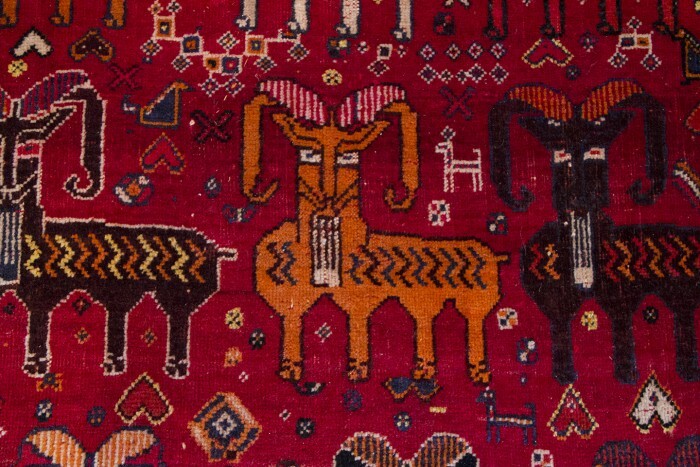 It is the most cheerful carpet in the house, with fifteen merry goats standing at attention, greeting the viewer. It lays on the floor before the wood stove, and is the first carpet one sees entering the house. I like it so much that I decided to make a huge floor pillow, using the design. My goal was something big enough to curl up on in front of the fire on a cold winter’s night – 30” square when finished – so I began with a big piece of 8/16 Penelope canvas, which comes in 36” rolls. To personalize my design I made a few amendments, including adding a little drawing of my Bengal cat, Pyewacket. Penelope canvas is lovely stuff, and a nice toasty brown colour. I decided to stitch using random long (or running) stitch, to get an effect as close to the original woven carpet, and all its subtle colour-blending, as I could. I used high quality American wool, “Waverly”, from the Brown Sheep Company. My intention was to actually mix shades in every needle-full, so I ordered two oranges very close to each other, three close reds, two ivories, and so on. 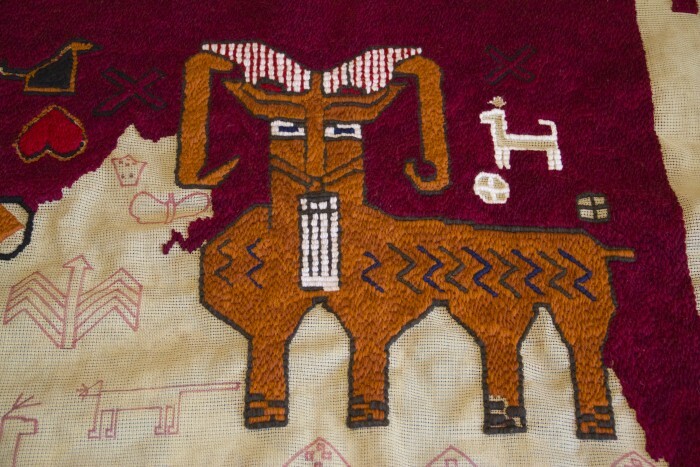 When you look at the carpet area I wanted to re-create, you think “Orange goat on red background; outlined in black, with small amount of cream and yellow in the little surrounding designs.” But when I carefully studied the carpet in sunlight I saw that of course the red background is shaded due to variations in the dye lots the weaver was using, as is the goat; and the black outline is in fact two separate shades, a very dark brown, and a very dark blue, and so on. It’s all much more subtle. I wanted the entire pillow to look like a tapestry of the carpet, and by blending the shades on every needle, it does. My Qasq’ai (or Qashqai) Persian carpet. Fifteen happy goats - red, black, white and orange - gazing attentively out at the viewer. This charming fellow was the one I wanted to enlarge and use for my floor pillow. I began by placing a piece of glass over the goat I wanted to re-create. 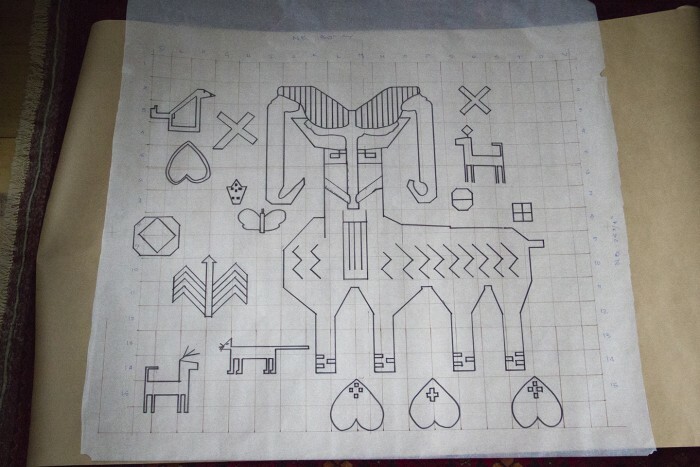 Using architect’s cream-trace tracing paper I drew the goat and related designs. 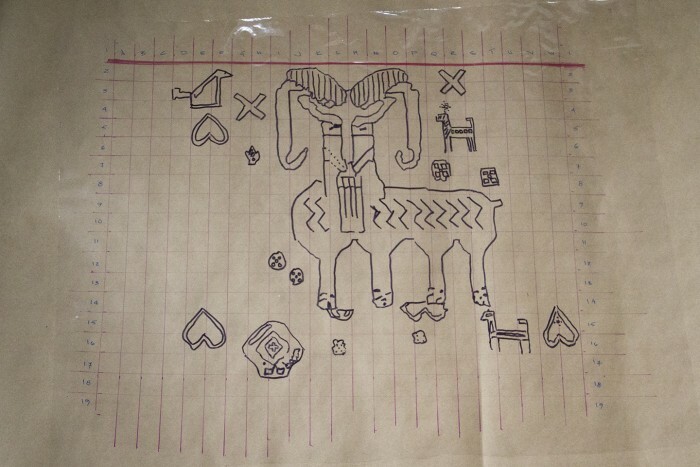 Then I squared it off using the age-old enlargement method used by the Renaissance painters, and enlarged the goat by more than one half, to fill my 30” canvas. 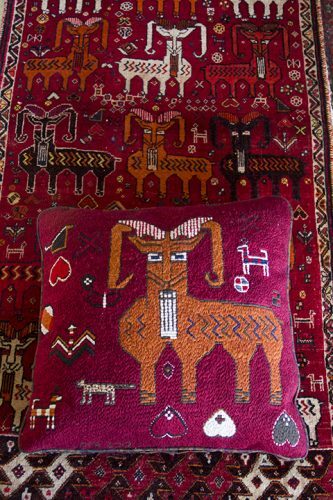 The goat on the carpet stands 12 ½” from tip of horn to hoof, and the one on my pillow is nearly 20”. This I re-drew on architect’s vellum, above. The inked canvas. I used red ink as the wool is mostly red. You can see I snuck a new animal in there, by the goat's front hoof - a leopard in honour of my Pyewacket. 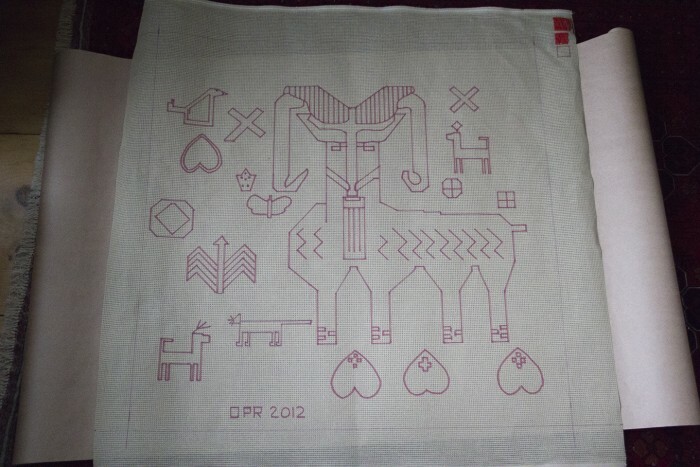 The pillow in progress, using random length running stitch. Despite its huge size the work went quickly, and in three months (of dedicated application) I had finished. This close-up shows the varying shades of orange and red I used, sometimes in the very same needle, to try to emulate the variations in the original carpet. The completed pillow. You can see how big it is compared to the original carpet! It has welt seams, and a zipper too to remove it for cleaning. I used a 34" down insert to make it nice and plump. If you’d like to see some of the carpets and needlework that inspire me please visit my Pinterest board. Amazing Craftsmanship!! No more pillows until the next book goes to press!! Lol! 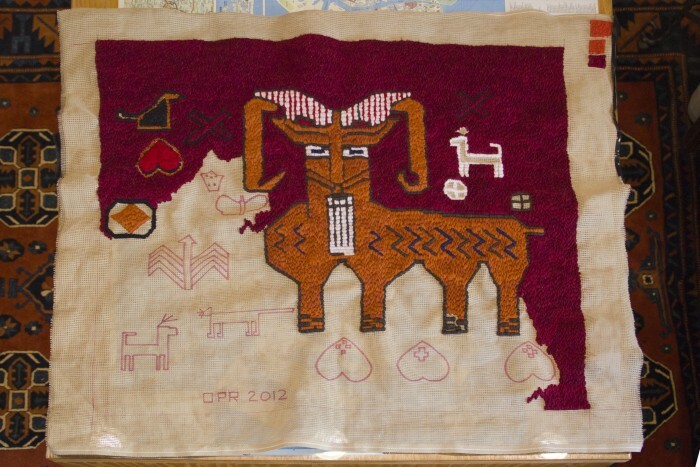 Your rug is another place to display art. It’s so beautiful. I love that you drew inspiration from it for your pillow. I quilt and paint. I’ve decided, after our move 2 years ago to the lake cottage we live in, to put my work in every room and give away so much more of it. Cold winter nights were made for this. You inspire with your words, but your pictures and your art work are equally inspiring. I am truly amazed. This is this is stunningly exquisite. A beautiful peice of art. Thank you so much! This big pillow does give me satisfaction every time I see it…and I do indeed toss it before the wood stove and curl up on it of an evening. 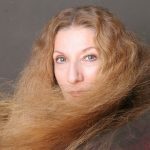 There is nothing like things we have crafted ourselves…When I work with wool I feel very close to Ceridwen and Ælfwyn. 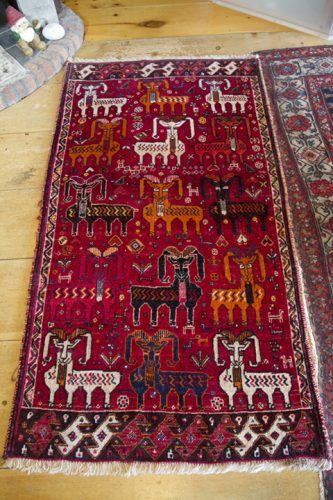 Love your rug – super colours – nothing like a needle and thread to relax with. My favourite is putting the binding on a quilt, folding it over and stitching it. Just finished all five of the Circle of Ceridwen – loved the story and the description of everyday life. Feel quite sad that it is finished but am sure I will be re-reading it again very soon. Sally, thanks so much for commenting on my Goat Pillow. It’s American wool, spun and dyed by the Brown Sheep Company. The making of it absorbed me entirely for three months during a tough patch in my life. I needn’t say more than that; a woman like you understands the healing nature of hand-work. I use the pillow in front of the wood stove in Winter; it’s so big it fits me and Pyewacket comfortably! I am just back – last night, in fact – from my beloved Gotland – Tindr’s home – and while there got a strong start on Book Six, so look for that later this year. Thank you for your devotion to, and understanding of, my work.